Mouthing the words he was ordered to say. I AM SICK to my heart, disappointed, and saddened by those who still fail to understand that Donald Trump has been captured by the Jewish power structure. His disgusting, sanctimonious justification for attacking Syria last night — and risking all of our lives and the future existence of the White race in the process — was absolute proof of that capture. Trump has handed the Jews exactly what they want, using exactly the pretexts and the lying “evil man who kills babies” posturing they authored for him — and giving in the process by far the most wooden, insincere, and robotic teleprompter performance of his entire career. My fellow Americans, a short time ago, I ordered the United States Armed Forces to launch precision strikes on targets associated with the chemical weapons capabilities of Syrian dictator Bashar al-Assad. A combined operation with the armed forces of France and the United Kingdom is now underway. We thank them both. I laugh at the invocation of the word “dictator” to make all good “democratic” Americans hate Assad. A “dictator,” I suppose, means any national leader who does not take his marching orders from Jews, does not install Jewish banks to drain the wealth of his working people, and does not permit Jewish oligarchs like Blankfein and Soros and Epstein to set up their media, geopolitical, and financial institutions to bribe and intimidate the lawmakers and control the behavior and thinking of the population. Sounds to me like the word “dictator” in today’s Newspeak really means the same thing as “savior” and “hero” meant in correct English. I suppose to most people a dictator is a leader who gives the people no choices. So what choice did Americans have the in last election? The open and avowed War Party candidate, Hillary Rodham Clinton; and the secret War Party candidate, Donald Trump. Some choice! Some freedom. Some “democracy.” Either way, American kids die. White European kids die. And innocent Middle Easterners — the ones who stayed home in their own countries and did not invade Europe or America — also die. We’ve killed millions so far since the Jews started to control our foreign policy, and made half the world passionately hate us in the process. Fifty-eight “strikes” then, and over 100 last night. How many innocents died in them, Donald Trump? I’d say the likelihood is that everyone who died in them was innocent, since the same old story about an “evil dictator” “gassing his own people” is getting so overused and long in the tooth that even a substantial portion of the TV-watchers are starting to snicker out loud when they hear it. Lately, it seems every time that that globalist tool of the Jewish power structure, John McCain, goes to the Mideast and visits Israel’s favorite US-funded and -armed jihadist “rebels” — or every time that Donald Trump signals to his base that we should leave Syria — all of a sudden Bashar al-Assad gasses some Syrian children. Does that make any sense to you? 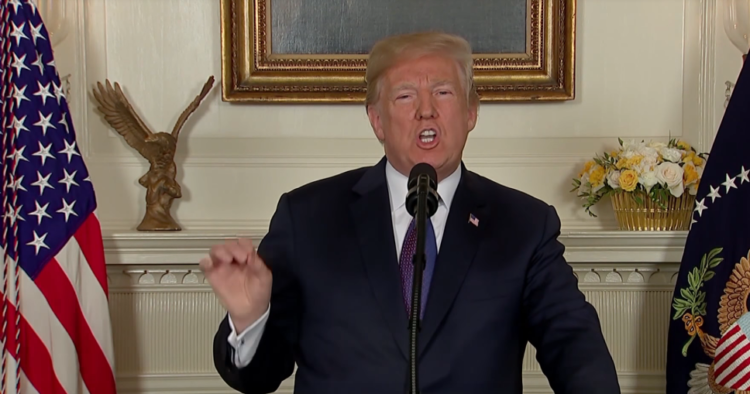 Especially considering that, with the help of Russia, President Assad had just about wiped out ISIS and the other rebels from the area where the chemical attack allegedly took place. ISIS and the rebels are nearly beaten. In the Douma area, negotiations were already taking place between the government and the rebels for safe passage of the latter out of the area. So, on the brink of total victory — in magnanimous negotiations with the defeated rebels — and after repeated warnings of massive and devastating Western intervention if chemical weapons were used — and knowing full well that tiny little Syria is no match for the US and other Western powers — Assad supposedly gases some Syrian babies in an area that had already been totally pacified? Are you kidding? Does that make any sense to you? The evil and the despicable attack left mothers and fathers, infants and children, thrashing in pain and gasping for air. These are not the actions of a man; they are crimes of a monster instead. Here we go with the typical Jewish demonization of the man they want to destroy: A monster; little children gassed and “gasping for air.” The film released to the media, showing Syrians who were purportedly victims of the gas attack in a hospital being doused with water, has been exposed as a fraud. One of the hospital workers in the video was identified by the Russian news channel RT and then interviewed. He said that the people shown in the video were indeed at his hospital yesterday, but they were victims of a fire in their building, not a chemical attack, and showed no symptoms of being poisoned. He did acknowledge that there were rumors being circulated of such attacks — and we all know that well-funded intelligence agencies are specialists in spreading disinformation and rumors — but that he saw absolutely zero evidence of any chemical weapon use. That’s the same conclusion arrived at by Russian investigators on the scene: no signs of any chemical weapon use, no residue, and no victims. Absolute zero. Nothing happened. By the way, the very real US/Allied attacks occurred just hours before another investigating team — this one from the Organization for the Prohibition of Chemical Weapons (OPCW) — was due to arrive on the scene. Why couldn’t we have waited those hours for the OPCW to gather their samples before starting to slaughter people and destroy the alleged “poison gas labs” where evidence might be found? Could it be because the Jews and their sycophants who run Washington know full well that the investigators would have found nothing? Could it be because the CIA or the Mossad needed a little time to plant evidence before the OPCW arrived? Strangely — or perhaps not so strangely — the US vetoed a UN resolution that would have required the OPCW to examine the site where the alleged chemical attack took place. Following the horrors of World War I a century ago, civilized nations joined together to ban chemical warfare. Chemical weapons are uniquely dangerous not only because they inflict gruesome suffering, but because even small amounts can unleash widespread devastation. The purpose of our actions tonight is to establish a strong deterrent against the production, spread, and use of chemical weapons. Establishing this deterrent is a vital national security interest of the United States. The combined American, British, and French response to these atrocities will integrate all instruments of our national power — military, economic, and diplomatic. We are prepared to sustain this response until the Syrian regime stops its use of prohibited chemical agents. It is true that a truly humanitarian leader, Adolf Hitler, refused to use chemical warfare, having experienced its horrors himself in World War 1. But can we really believe that the Washington regime’s motivation here is to prevent such suffering? I don’t think so. It’s a regime that, throughout the Bush, Obama, and now Trump administrations has been sending drone missiles into apartment buildings, and calling the babies they kill “collateral damage.” It’s the only regime on Earth that has used atomic bombs on civilians. So I suspect that the rhetoric against chemical weapons is really just to keep small nations from breaking the large nations’ current monopoly on relatively small and low-cost, but devastating and extremely effective, weapons: We can have nukes and other means of killing a million people in a day — but nobody else can! What humanitarianism. And what hypocrisy! The United States has the largest admitted stockpile of chemical weapons in the world and has not fully renounced their use. Israel has a large stockpile as well, which it doesn’t acknowledge and refuses to renounce. That statement is really rich when you consider that the United States of America, under the subversive and Jewish-dominated Roosevelt/Truman administrations, and with the help of Judaized Britain, was a real pioneer and still-unsurpassed leader in the mass murder of innocent men, women, and children — think of Hamburg, Dresden, Cologne, Hiroshima, Nagasaki. Think also of the now decades-long embargoes, wars, and drone wars for Israel in the Middle East, and their millions of victims. No other nation on Earth has unleashed the horrors of mass atomic warfare, and inflicted horrible lingering death on so many innocent civilians as has the alien-controlled regime in Washington, DC.
. . . In Syria, the United States — with but a small force being used to eliminate what is left of ISIS — is doing what is necessary to protect the American people. Over the last year, nearly 100 percent of the territory once controlled by the so-called ISIS caliphate in Syria and Iraq has been liberated and eliminated. Lies piled upon lies. First: The Washington regime is not protecting the American people by engaging in these wars for Israel. The Washington regime is putting the American people in harm’s way. And by escalating these wars for Israel into a conflict with Russia, we — and all of European civilization — are being put in harm’s way more than ever. Our nation and civilization were grievously harmed by the totally unnecessary slaughter of brother versus brother in World War 1 — and injured even more, perhaps fatally, by the brothers’ war called World War 2; both of them wars in which the United States became involved mainly at Jewish behest. A war between the two remaining White superpowers might well be our death knell. Second: What hubris Trump’s speechwriters show in taking credit for the defeat of ISIS in Syria, when 1) the US was all along supporting rebels who wore a “moderate” hat one morning, and an ISIS hat the next; and 2) it was Assad and Putin who defeated ISIS in Syria and everyone knows it — including Donald Trump. We need to stop believing the liars and master manipulators who have captured Donald Trump. We need to grow up. Let me tell you something: Wars are never fought or declared because “innocent babies are being killed” or “babies are being thrown out of incubators” or the like. Never. Wars are always fought over resources and power and wealth; over the dominance or rule of one race or tribe or nation over another. Atrocity stories are sometimes true, but very often untrue. Their purpose, however, is always to get the ordinary, decent families of a nation so angry that they’re willing to send their own sons to be slaughtered. The Jewish power structure that wants to send your son to die for Israel doesn’t care about Syrian babies, or any babies except Jewish ones, I can assure you. Don’t fall for their atrocity stories. And definitely don’t fall for these latest “chemical weapons” whoppers that a fairly bright sixth-grader could see through. Your attitude to the unprovoked US attack on Syria is both an IQ and a moral test. Trump has made a pathetic spectacle of himself by buckling under to the neocons and the Jewish interests, whose wars he was condemning just 16 months ago. I do not know what threats were made against his interests or his family, but he should not have taken the coward’s way out. He should have written the speech he just delivered, and told everyone, without exception, that he was going to deliver it and order the strikes. Then, while the world’s cameras were rolling, he should have told the exact truth about the threats that were used against him — and by whom they were made. Then he should have used his powers as Commander-in-Chief to seize the nerve centers of the Jewish power structure and begin the liberation of this nation. The threats against his person and his family might have been carried out, and he might have even died, but succeed or fail, live or die, he would have been a hero and an inspiration instead of a groveling, teleprompter-parroting worm. Let us all swear to one another that, whatever comes, we will defeat those who have stolen our future from us.